Hey y'all! 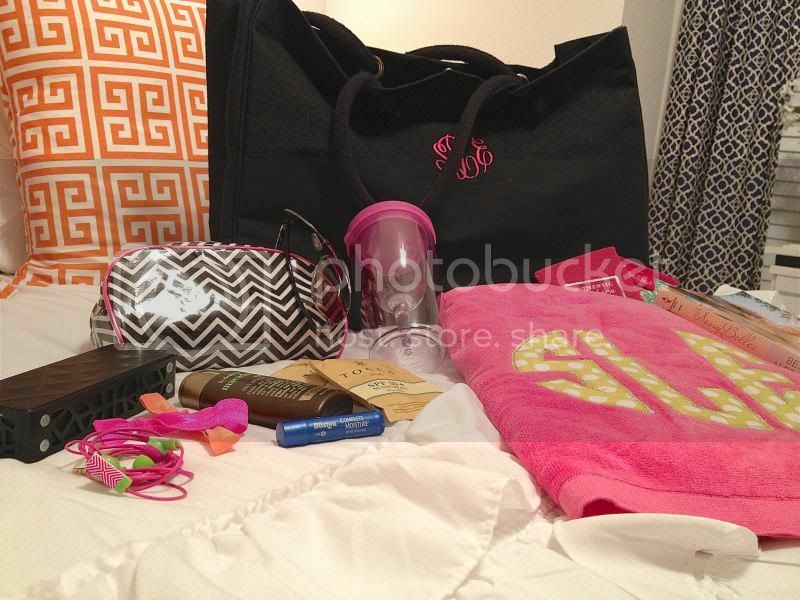 So, I was getting some things together for this weekend and thought it would be fun to share with y'all what's in my beach/pool bag! I swear I have the world's largest pool bag, but I hate being all the way out at the beach or pool and not have something I need! So here are the things that are a must have for my bag. • Tocca 30+ Sunscreen Towelettes- I first got these in one of my birchboxes and was hooked ever since. They protect your skin without giving you that sticky feeling..and have more than enough sunscreen for your entire body and are waterproof so no worries about having to constantly reapply. • Macadamia Dry Styling Oil- This is/was one of my go to products for pool & beach hair, especially when I had longer hair. I would hate how "dryed out" my hair (especially the ends) would look after take a dip in the pool or ocean. This styling oil helps to keep the frizz away while hydrating your hair. • Emi-Jay Hair Ties- I'm sure by now y'all have all heard of these! Definitely one of my most important things that I have in my bag! I can't stand for my hair to get in my face while laying out especially if it's super windy out, so these do the trick. • Blistex Complete Moisture- My favorite, favorite chapstick..and it has SPF..very important while out in the sun, because my lips tend to be the first thing that get sunburnt, which this chapstick prevents. • Headphones- I don't listen to music all that much while at the pool or beach because I normally read but I always have a pair of earbuds just in case I want to listen to some songs on my iPod, and how cute are these Macbeth Collection ones? • Wireless Speaker- Like I said above I don't normally listen to music but T likes to jam out and this bluetooth speaker is perfect for the pool or beach. • Rayban Aviators- I have tons of cheapo sunnies but my aviators are my go to sunglasses to wear while laying out, I just feel like they fit my face the best and don't fall down my face (like so many of my other sunnies). • Coozies- I can't go out in the sun without a couple coozies for a cool beer drink. I always make sure I have at least 2 in my bag, these are two of my favorites from Lilly & Southern Marsh. • Vino2go Sippy Cup- This has got to be the greatest invention EVER! I had seen this cup a long time ago on pinterest and T actually scoured the interest for one and ended up giving me one for Christmas! I definitely love my wine, and obvi no glass is allowed at the pool so this cup is perfect! They actually just came out with an XL vino2go cup-which is on my to-purchase list. • Reading Material- I'm a huge book reader while laying out and I love to have at least a couple things to switch back and forth from. Of course a couple trashy gossip mags and a good book. I'll actually be reviewing the book pictured "Sassy Belles"...it is such a good read and I can't wait to share it with y'all..perfect summertime book! • Beach Towel- Well, obviously this is the number one important thing in my bag, I actually usually carry a few beach towels with me just incase, especially on the beach..a sandy towel is NO fun! • Sunhat/ Baseball Cap- I'm also guilty of taking 2 different hats with me..a big floppy sunhat and a baseball cap. I love that the sunhat provides enough shade for my face as well as my upperbody but sometimes it just gets to windy to keep it on which is when I switch to my baseball cap! Both my floppy hat and baseball cap are from Marley Lilly, who has super cute options available to choose from! 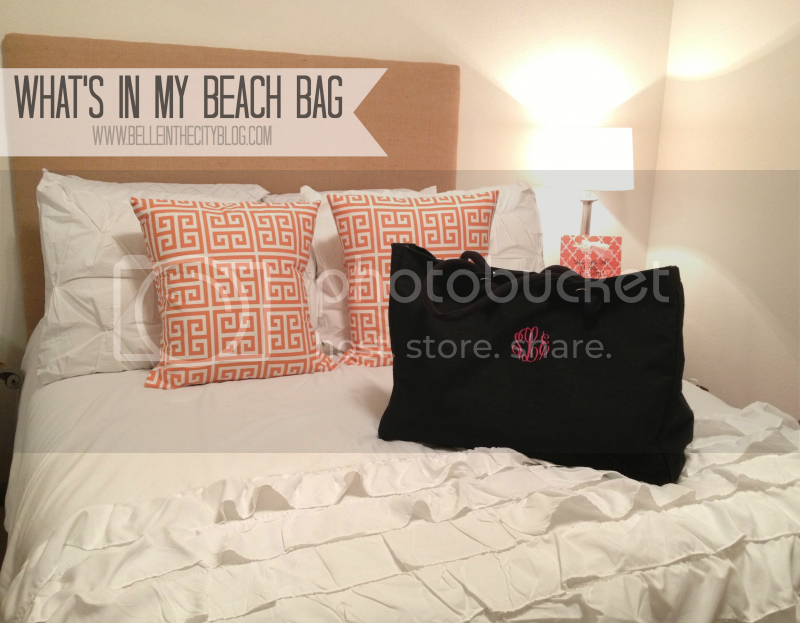 What do y'all keep in your beach bag? Do share!! I NEED a beachtowel like that. Where can I find one? gracious that is a huge big bag haha, love those earbuds! 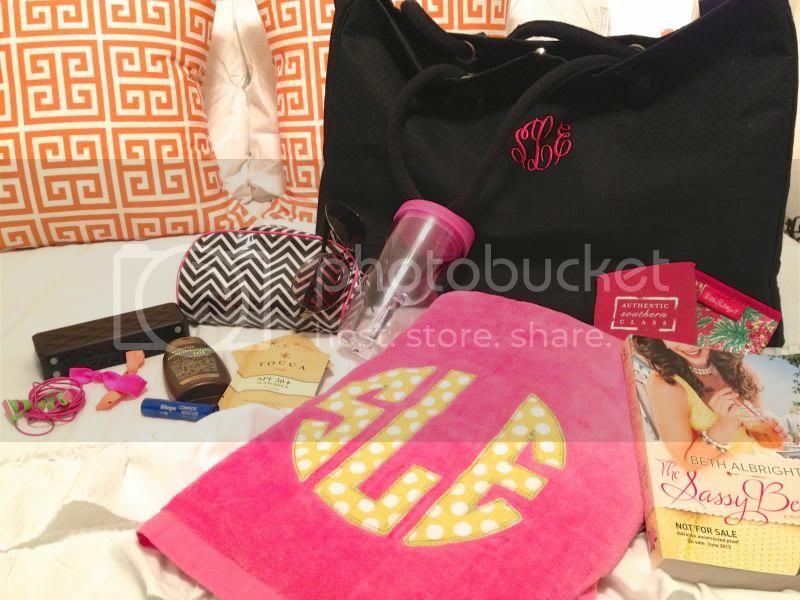 Love all the monograms. Have you read that book? It looks like something I would love! Love love love that wine cup! I have been lusting over it myself. Also I am in LOVE with that towel. Great post!!! so cute!! love Marley Lilly sooo much! I love posts like these! They are so great! I love your beach towel, where did you get it? I hope you have a great weekend at the beach! I need to come over and lay out with you!! I don't have a pool over here on ol' Western, haha Let me know when you need a laying out partner! Please tell me where you got tis super sized beach bag? I love it!